Windows 10 has Edge as its default web browser in the place of Microsoft’s traditional web browser, the Internet Explorer, in all the devices. Also, Microsoft Edge is now the default pdf reader to open and view pdf files in Windows 10 supported workstations. Unable to open PDF files in MS Edge? The earlier versions of Windows platforms (Windows 7 or Windows 8) have a universal PDF supported that allow opening PDF files using Acrobat Reader, Adobe Acrobat, or Foxit Reader, or similar programs. 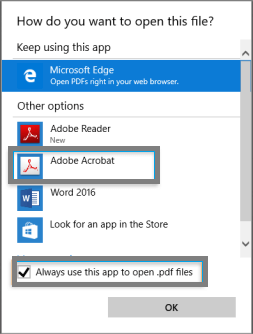 But after making an upgrade to Windows 10, PDF files are automatically opened in PDF Explorer even if the Acrobat Reader is installed on the machine. Microsoft Edge provides only minimal access controls (like zoom in, zoom out, print etc. ), and lacks some convenient features, like, sending the PDF as an attachment with Outlook. MS Edge remains the default PDF reader even if the user reinstalls Acrobat Reader in order to access the PDF files. Amid the process, the file can become inaccessible, and MS Edge may indicate some error messages. Simply, Edge users often face issues while opening PDF files in their browser. 1.Reach Control panel, and open it. 2.On Control panel home, select Default Programs. 4.Search for PDF entry, and select Change Program option. 5.When a pop-up appears on the screen, then select Microsoft Edge program to open PDF file. 6.Now, select and check on Always use this app to open .pdf. 7.Click OK to save the changes. 1.Select PDF file and then right click on it. 2.Select Open with option, and click Choose another app. 3.Select Adobe Acrobat option, when the dialog box is displayed on the screen. 4.Check mark the Always use this app to open .pdf box to save the settings for future use. How to open Inaccessible PDF files? 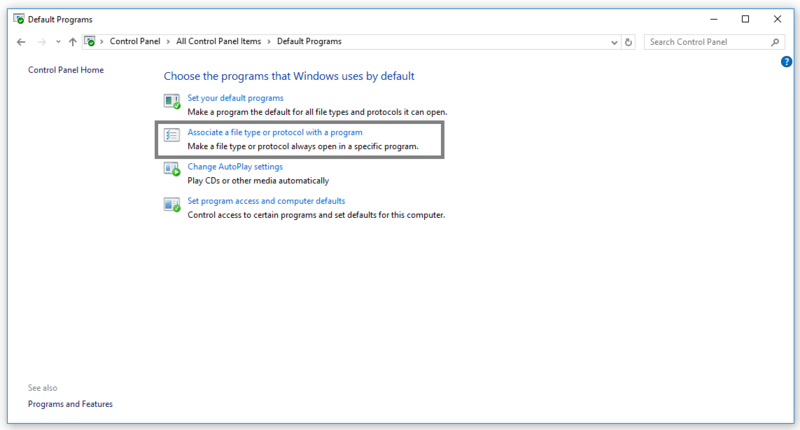 If the user has changed the default PDF reader from Microsoft Edge to some other program while upgrading to Windows 10, use the following instructions to make Microsoft Edge as default PDF viewer again. 1.Select and right-click the PDF file. 2.Choose Open with, and then select Choose another app. 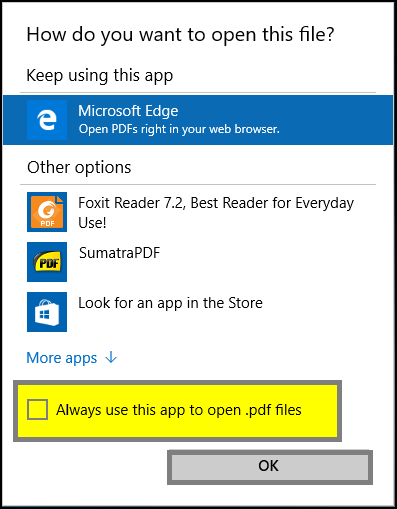 3.After selecting Choose another app, select Edge to make it default PDF reader. However, if the user still faces problem to open PDF file, he may use some third-party PDF repair tool to repair PDF files and restore the file without any alterations. 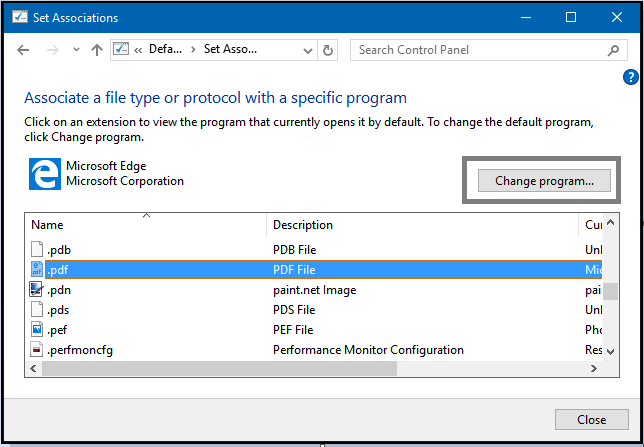 Though Edge is the default PDF viewer in Windows 10, users often refrains to use Microsoft Edge PDF viewer due to various reasons. As the option to change the default settings is available, users try to switch to other PDF viewing programs like Acrobat Reader. However, many PDF inaccessibility issues are often encountered thereafter.